Sometimes it seems like all my ancestors were farmers, but the records tell me differently. Some of the occupations I've found: shoemaker, milliner, wheelwright, mine worker, preacher, and sawmill owner. My dad was a sheet metal worker; I have several photos of him at work. I will be using the "Workday Wednesday" theme for sharing photos, stories, and records related to my ancestors' work lives. If you like, join me in posting on your own blog, or as a comment here, how your ancestors spent "Workday Wednesday!" I've decided to participate in this meme, as the occupations of my ancestors are of interest to me. This week I am looking at the occupations of my maternal great grandfather, Melvin Van Every. At some point in the late 1950s, I think, my Great Aunt Minnie (Minnie Van Every Benold) gave my mother a Family Register. I believe most of the research had been done by Minnie's eldest daughter, but there are some additional notes handwritten by Minnie. Here's the paragraph on Melvin Van Every, who was Minnie's father, so I have reason to trust it as far as one can expect a child to have a good recollection of her father's life. Melvin Van Every, son of Samuel was born August 30, 1863 in Michigan and died in Texas, May 26, 1929. He is buried in El Paso, Texas. He was of a more or less pioneering nature and was self-supporting from the age of 14, having come to Texas with his father at the age of 10. In his early life he was a sheep raiser, then went into cotton gin work and raised much cotton himself. Then he purchased and improved and resold farms, reinvesting his profits. Still later he went into the bee business and dairying, operating sometimes 500 colonies of bees. 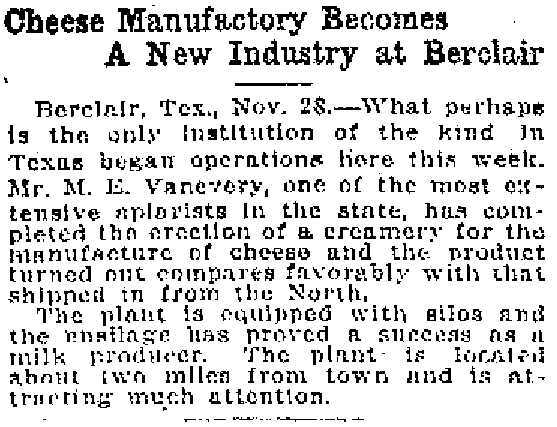 In 1917 he moved to west Texas and purchased several farms, which he began to improve. At the time of his death he was living on one of three farms near Garfield, New Mexico. He was a very religious man, a Methodist and a member of the Masonic order. He first married Mary Jane Denyer, Aug 29 1883. She was born Sept 1, 1868 and died May 2, 1923. He married second Josie Thedford. I have managed to verify some of this with newspaper articles. 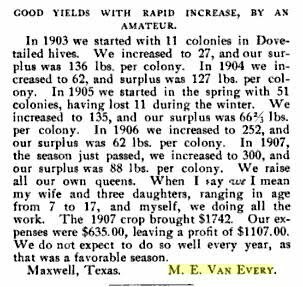 Below we see a letter from the 1908 volume of Gleanings in Bee Culture. This indicates starting in 1903, by 1907 he was up to 300 colonies. 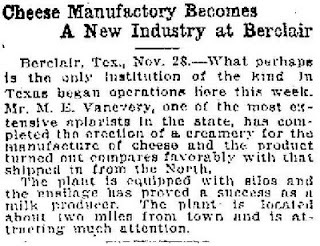 A November 1914 issue of the Galveston Daily News confirms he was into dairying. 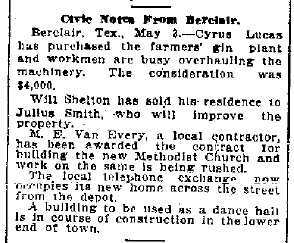 And a May 1913 news clipping suggests he got himself involved with building contracting. I still haven't found confirmation of his early activities raising sheep or cotton, but I have no reason to doubt it.